St. Clare founded her Monastery in San Damiano in Assisi in 1212 and from those earliest times there was a rapid growth of Poor Clare Monasteries throughout Italy. At the time of St. Clare‘s death in 1253 there were at least 113 Monasteries distributed throughout Italy, France. Belgium, Spain, Germany, Switzerland, Poland, and Czechlovakia (then called Bohemia.) This growth continued throughout the following centuries and still does today. The following is a brief summary of some of the foundations of Monasteries in various parts of the world. In 1621the first Poor Clares from Spain arrived in Manila in the Philippines and today there are 24 Monasteries of Filippina Sisters. In 1936, a Poor Clare foundation was made at Vinh in Vietnam. Japan has three Poor Clare foundations; Tokyo !947, Nishinomiva 1949; and Tokyo 1950 and others have followed. Sri-lanka had a foundation in 1953 from the Poor Clare Monastery in York, England. The Poor Clares have been in Taiwan since 1969. In Germany there are 11 Monasteries of Poor Clares. In 1951 the Poor Clares in Galway made a foundation in Campbelltown, Australia. Then in 1971 the Poor Clares in Ennis, Ireland, in conjunction with the sisters in Campbelltown, established a Monastery in Aitape, Papua New Guinea, at the invitation of the Australian Friars in that Diocese. The Flemish Poor Clares made a foundation in Lebanon 1959. In August 1294 a Poor Clare foundation was established at Aldgate in London. Today there are 9 Poor Clare Monasteries in England. In Ireland we have Monasteries in Galway (1642) Carlow (1893), Dublin (1906), Cork (1914), Glasgow in Scotland, (1951) and Ennis (1958) were both founded from the Cork Monastery, Drumshanbo (1973). 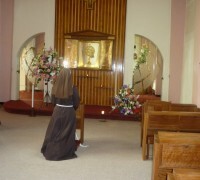 Throughout the world today the Poor Clares number over 20,000 sisters in over 70 countries.